Is there anything that Oprah Winfrey can't do? In the over three decades since the Queen of All Media, who's turning the big 6-5 on January 29, became a household name, she's proven that she's a powerhouse at just about everything she puts her mind to. Longest-running daytime talk show host ever? You betcha. Academy Award-nominated actress? Oh yeah. Multi-media mogul extraordinaire? You now it. Humanitarian par excellence? Mm-hmm. We could go on and on and on, but you get the point. She's not known simply by her first name for nothing. But life hasn't always been easy for Oprah. The self-made billionaire's formative years were the very definition of hard-scrabble, with allegations of abuse and a teenage pregnancy that ended in tragedy haunting her. But it's perhaps because of that, and not in spite of it, that Oprah's story is an inspiration for the ages. She's a legend, hands down. 1. Oprah was born on January 29, 1954 in Kosciusko, Mississippi to unmarried teen mother Vernita Lee. 2. Her first name is actually spelled Orpah on her birth certificate after a biblical figure in the Book of Ruth, but people mispronounced it and Oprah stuck. 3. She grew up believing Vernon Winfrey was her biological father, however, in 2003, Mississippi farmer and World War II vet Noah Robinson Sr. came forward with a claim that he was her actual father. She refused a paternity test. 4. Oprah spent the first six years of her life living with her grandmother Hattie Mae Lee, who was so poor that the future media mogul often wore dresses made of potato sack. The unconventional clothing earned her the nickname "Sack Girl" among the local children. 5. According to Oprah, she used to endure some harrowing physical punishments at the hand of Hattie Mae. "I went to a well to get some water and carry it in a bucket. And I was playing in the water with my fingers, and my grandmother had seen me out the window and she didn't like it," she told David Letterman in 2012. "She whipped me so badly that I had welts on my back and the welts would bleed. And then when I put on my Sunday dress, I was bleeding from the welts. And then she was very upset with me because I got blood on the dress. So then I got another whipping for getting blood on the dress." 6. Hattie Mae also taught Oprah how to read by the age of three and would take her to church, where she earned the nickname "The Preacher" for her ability to recite Bible verses. 7. When she was six, she moved to Milwaukee, Wisconsin to live with her mother, who had given birth to another daughter, Patricia, in the six years that Oprah was living with her grandma. Patricia would later die of causes related to a cocaine addiction at the age of 43. 8. By 1962, unable to care for her two daughters, Vernita would send Oprah to live with her father Vernon in Nashville, Tennessee. While she was away, Vernita would give birth to another daughter (who she gave up for adoption and was later named, coincidentally, Patricia) and a son, Jeffrey. Oprah wouldn't even learn of Patricia's existence until 2010. Jeffrey, however, died of AIDS-related causes in 1989. 9. As she revealed on her talk show in 1986, Oprah was molested by a 19-year-old cousin when she was only nine years old. For years after that, she was also assaulted by an uncle and a family friend. When she opened up about the alleged abuse at the age of 24 to family members, they reportedly did not believe her. 10. She became pregnant at 14 and prematurely gave birth to a baby boy, who died shortly after being born. The world learned of Oprah's secret pregnancy in 1990 when a family sold the story to the National Enquirer. While she didn't name which family member betrayed her when writing about the experience for O, The Oprah Magazine's February 2007 issue, the Associated Press reported it was her deceased half-sister Patricia who, as Oprah wrote, "sat in a room, told them the story of my hidden shame and left their offices $19,000 richer." 11. high school, Oprah returned to Nashville for good to live with Vernon, where education at East Nashville High School became a priority. There, she was voted Most Popular Girl and joined the speech team, which helped her secure a full scholarship to Tennessee State University. 12. Her first job as a teenager was working at a grocery store, where she was, ironically, forbidden from speaking with customers. 13. In 1971, after winning Nashville's Miss Fire Prevention contest, the pageant's sponsor, radio station WVOL, offered her a job reading the afternoon headlines on air. 14. In 1972, she won Miss Black Tennessee and went on to compete in Miss Black America. 15. At just 19, she became both the youngest news anchor and first black female anchor for Nashville's WLAC-TV, leaving TSU, where she was studying communications, to do so. 16. After an eight-year stint co-hosting a local morning show in Baltimore, Maryland, she relocated to Chicago to take over WLS-TV's low-rated half-hour morning show, AM Chicago, in 1983. Her first episode aired on January 2, 1984 and, within months, the show went from last place to besting Donahue as the highest-rated talk show in Chicago. 17. When Oprah received the offer from King World to take her show into national syndication, it was famed movie critic Roger Ebert who convinced her it was be foolish to say no. While on their first of two dates in the mid-‘80s, he grabbed a napkin at the restaurant where they were enjoying dinner and started "jotting down some numbers," according to a 2005 post on Oprah.com. By his prediction, she would make 40 times what he was making for At the Movies. "He slid the napkin across the table to show Oprah the final tally and she said, ‘Deal done!'" The Oprah Winfrey Show began broadcasting nationally on September 8, 1986. 18. Before The Oprah Winfrey Show went national, Oprah was already a household name thanks to her work in Steven Spielberg's 1985 adaptation of The Color Purple. For her turn as Sofia in the film, Oprah was nominated for Best Supporting Actress at the 1986 Academy Awards. 19. In 1986, Oprah launched her multimedia production company Harpo Inc. The name is both her name spelled backwards and the name of her The Color Purple character's husband. 20. For the first national episode of her show, Oprah wanted Don Johnson, star of Miami Vice (then the biggest show on TV) as her first guest, even going so far as to send him a very expensive pair of rhinestone sunglasses to try and persuade him. But he wasn't feeling it. Rather than find a back-up star, Oprah had the genius idea to make her show not just about celebrities, but about everyday people, also. "So what we came up with was a show called ‘How to Marry the Man of Your Choice,'" she explained years later. Johnson would eventually appear on her show, during the premiere episode of the final season in 2010. And he made sure to return the glasses. "I know it has taken me about 24 years to get these back to you," he told her. 21. In one of Oprah's most memorable early episodes, after a highly-publicized diet, she arrived on stage in 1988 pulling a wagon full of 67 pounds of animal fat to illustrate exactly how much weight she'd lost. In 2016, she told Entertainment Tonight that the unforgettable moment was also one of her biggest regrets. "Big, big, big, big, big, big, big mistake!" she told the outlet. "When I look at that show, I think it was one of the biggest ego trips of my life." 22. In 1993, Oprah sat down with Michael Jackson for an interview that broadcast live from his Neverland Ranch. It was the entertainer's first interview in 14 years and, as such, it really brought in the viewers. Taking place before any allegations of sexual abuse had been made, the interview became the fourth most-watched event in American TV history and the most watched interview ever, with an audience of 90 million worldwide. 23. In 1995, while interviewing four mothers with past drug problems alongside Washington Post reporter Patrice Gaines on her show, Oprah admitted on-air that she'd smoked crack cocaine in her 20s. "Let me say this, and this is probably one of the hardest things I've ever said," she said, her voice cracking. "But I was involved with a man in my 20s who introduced me to the same drug that you've been talking about and, like Patrice, I always felt that the drug itself is not the problem but that I was addicted to the man I can't think of anything I wouldn't have done for that man." 24. In 1996, Oprah launched the Oprah's Book Club segment on her show. 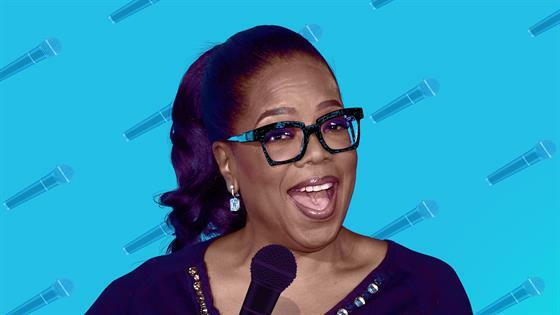 Proving how much power her endorsement carried, each new book she announced as the latest in her club would go on to become a best-seller and the term "The Oprah Effect" was coined. 25. When official book club selection A Million Little Pieces was proven to be a fabrication by author James Frey in 2006, Oprah brought the author and his publisher Nan Talese onto her show to publicly chastise them. She told James that by fabricating part of his purported true story of addiction and recover, he'd "betrayed millions of readers," before forcing Nan to admit that she'd not done anything to fact-check the book heralded as "brutally honest" in its press release. Three years later, Oprah would apologize to James for confronting him so publicly. 26. After a 1996 episode about mad cow disease in which Oprah claimed she'd been stopped cold from ever eating another burger, she and her guest Howard Lyman found themselves sued by Texas cattleman in 1998 for "false defamation of perishable food" and "business disparagement." The claim argued that Oprah's comments had caused cattle prices to fall, costing beef producers $11 million. After jurors sided with her and rejected the lawsuit, Oprah said, "Free speech not only lives, it rocks," adding, "I'm still off hamburgers." 27. In preparation for the trial, Oprah hired the services of Phil McGraw and his legal consulting firm Courtroom Sciences, Inc. (the inspiration for the current CBS drama Bull) to help her analyze the jury. After her victory, she was so impressed with his services that she invited him on her show. So, what we're saying is that you have Texas cattle farmers to thank for the Dr. Phil show. 28. The popularity of The Oprah Winfrey Show in its heyday is also responsible for launching (or boosting) the careers of Dr. Oz, Rachael Ray, Iyanla Vanzant, Nate Berkus, Suze Orman, and, of course, BFF Gayle King. 29. When Ellen DeGeneres chose Oprah's show to publicly come out as a lesbian in 1997, just before her character on her sitcom did the same to her therapist, played by the talk show host, it earned Oprah some not-so-positive reactions. "I played the therapist on that show... and got the most and worst hate mail of my entire career after doing it, like 'Go back to Africa' hate mail," she admitted in a 2013 episode of her show Oprah's Next Chapter. 30. After the Ellen moment, Oprah and Gayle began facing never-ending rumors that they are gay. In the August 2006 issue of O magazine, she shut the chatter down once and for all. "I understand why people think we're gay", she wrote "There isn't a definition in our culture for this kind of bond between women. So I get why people have to label it—how can you be this close without it being sexual? I've told nearly everything there is to tell. All my stuff is out there. People think I'd be so ashamed of being gay that I wouldn't admit it? Oh, please." 31. By 2000, after winning a combined 15 Daytime Emmy Awards, she refrained from submitting the show for any further consideration, hoping to make room for others to be nominated. 32. In 2003, Oprah joined Forbes' list of The World's Billionaires, as the first black female billionaire in the world. From 2004-06, she was the only black billionaire in the world. As of today, her net worth is estimated at $3.1 billion. 33. According to biographer Kitty Kelley's 2010 tome on Oprah, she and John Tesh had a short-lived relationship in Nashville in the 1970s. As the report alleged, they lived together until the future Entertainment Tonight host bolted in the middle of the night, caving to the social pressures of being in an interracial couple. 34. Oprah met boyfriend Stedman Graham in 1986, the same year that her talk show went national. The couple got engaged in 1992, but have famously never tied the knot. "The truth of the matter is, had we gotten married we wouldn't be together now, because in no way is this a traditional relationship," she told Essence in 2003. 35. A fan of the Oxygen network? You have Oprah to thank for that. In 1998, she teamed up with former Nickelodeon executive Geraldine Laybourne and producers Marcy Carsey, Tom Werner, and Caryn Mandabach as founders of Oxygen Media. Their cable network was launched two years later. In 2007, NBC Universal purchased the network for $925 million. 36. In 2004, Oprah famously gave all 276 members of her studio audience a brand-new Pontiac G6. The total cost? Just under $8 million. And each and every lucky winner was hit with a tax bill, totaling upwards of $6,000 for some, as a result. 37. In 2008, Discovery Communications announced that they were teaming up with Oprah's Harpo Productions for a joint venture, re-launching Discovery Health as OWN: The Oprah Winfrey Network. The channel was the culmination of years of discussion between Oprah and Stedman about the media mogul creating her own network dating as far back as 1992. After some delays, OWN officially launched on January 1, 2011. 38. That same year, The Oprah Winfrey Show aired its final episode on May 25. The series lasted for 25 seasons, making it the longest-running daytime talk show ever. 39. To prepare for her role in the 1998 film adaptation of Toni Morrison's novel Beloved, Oprah sought out a man named Arthur Cohen, who re-enacts slave escapes along the Underground Railroad route, to re-enact the slave experience for her. "Yes, in Maryland I went through all that," she told Roger Ebert that year. "That's where I really touched the dark space. I originally wanted to do the exercises just as a matter of physicality. Like OK, what's it like to be barefoot in the woods and in the hot sun? I was gonna try to experience a part of the Underground Railroad for a couple of days. Sitting under a tree during that experience, though, I touched the dark, hollow, death-without-salvation place. `Oh, that's what it is,' I thought. `That's what it is.' "
40. Oprah has acted in six feature films, with her voice appearing in another five animated features. 41. She is one Grammy Award from earning her place on the list of esteemed EGOT winners. Aside from her many Daytime Emmys, she earned a Primetime Emmy in 2000 as producer of Tuesdays With Morrie (which won Outstanding Made for Television Movie) as well as the Bob Hope Humanitarian Award in 2002's ceremony. She earned her Tony in 2016 as producer of The Color Purple, which won Best Musical Revival, and earned her Oscar in 2011 when she was awarded the Jean Hersholt Humanitarian Award. 42. Oprah was the first-ever recipient of the Bob Hope Humanitarian Award. 43. Not one to ever pay for interviews, Oprah admitted in 1998 that she turned down a chance at massive ratings by sticking to her guns and telling Monica Lewinsky's team there'd be no check. "I do not pay for interviews," she told Roger Ebert that year. "My producers were like, `How can you say no? It's the biggest interview of the year.' I said, 'Watch me say no.' "
44. In 2004, she became the first black person to rank among the 50 most generous Americans and remained there until 2010. 45. Oprah's Angel Network, a charity that supported charitable projects and provided grants to nonprofit organizations around the world, was launched in 1998. With Oprah personally covering all administrative costs associated with the charity, all of the over $80,000,000 raised by the charity went directly to charity programs. In May of 2010, with Oprah's show nearing its end, the organization stopped accepting donations and was shut down. 46. After a 2000 discussion with South African president Nelson Mandela, Oprah made the decision in 2002 to invest $40 million and her time to establish the Oprah Winfrey Leadership Academy for Girls in Henley on Klip, just south of Johannesburg. The school officially opened in 2007. 47. Though the Academy has done a world of good for its students, it's also faced its share of criticism and controversy. Most notably, in its first year of operation, a female staffer was accused of physically and sexually assaulting students. Oprah flew to the school to meet with officials and parents and the matron was eventually arrested after seven students submitted statements detailing their alleged assaults. 48. After Oprah donated $12 million to the Smithsonian's National Museum of African American History and Culture, President Barack Obama awarded her with the Presidential Medal of Freedom, the highest civilian award in the United States that recognizes people who have made "an especially meritorious contribution to the security or national interests of the United States, world peace, cultural or other significant public or private endeavors"
49. When Oprah graced the cover of Vogue in 1998, she was the first African-American TV and film celebrity to do so. And famed editrix Anna Wintour told her to lose weight to do it. "It was a very gentle suggestion," Anna later recalled on 60 Minutes. "I went to Chicago to visit Oprah, and I suggested that it might be an idea that she lose a little bit of weight. I said simply that you might feel more comfortable. She was a trouper!" 50. Oprah's main residence is a 23,000 square-foot Georgian estate in Montecito that she's nicknamed "The Promised Land." Purchased for somewhere around $50 million, the original property was 42 acres, but when her neighbor died in 2016, she bought up the additional 23 acres of land. 51. The additional Montecito property was purchased for $28.8 million. The "once in a lifetime property" hadn't been on the market in over 30 years. The house has horse pens, covered stalls and riding areas, but Oprah didn't want the horses, so they weren't also included in the sale. 52. She also owns 163 acres of property in the Hana area of Maui and a five-bedroom home in Telluride, Colo.
53. According to Politico, Oprah's Montecito water bill was "just shy of $125,000" in 2013. The following year, during the California draught, she had tanker trucks filled with water shipped in to keep her grounds lush and green. 54. A little over a decade ago, Oprah purchased a Global Express XRS executive jet from Bombardier Aerospace for a whopping $42 million. 55. In 2006, she anonymously purchased Gustav Klimt's "Adele Block-Bauer II" for $87.9 million. And 10 years later, she decided she didn't want it anymore, with TIME reporting that she sold it to a Chinese collector for around $150 million. 56. Her greatest extravagance? "Flying in English muffins from Napa Valley," she told People's Jess Cagle in 2017. "There's a specific English muffin made by these two women at this wonderful bakery in Napa Valley. I know it's not a good carbon footprint to fly in your English muffins but…" The muffins come from The Model Bakery and cost $40 for a dozen and a jar of Clif Family preserves to spread on them. 57. According to Forbes' 2018 list of America's richest self-made women, Oprah ranked No. 6. She remains the richest African-American woman on the list. 58. In 2017, Oprah admitted to Ellen that she went to the bank for the first time since 1998 to deposit a $2 million check. "I just wanted to," she said. "I just wanted to do it. I stood in line — just to do it!" As for how it felt? "Fantastic," she revealed. 59. The first time Oprah ever publicly endorsed a candidate running for office was in 2008 when she threw her weight behind eventual winner Obama. She held a 2007 fundraiser for him at her Montecito estate and then joined him at a series of rallies in early primary states of Iowa, New Hampshire and South Carolina. 60. In 2018, she canvassed door-to-door for Georgia gubernatorial Democratic candidate Stacey Abrams. 61. A course focusing on Oprah's business acumen has been taught at the University of Illinois, entitled "History 298: Oprah Winfrey, the Tycoon"
62. In 2006, Oprah's deal for a book about keeping weight under control was announced to top Bill Clinton's $12 million record advance for his autobiography, though the exact number wasn't revealed. 63. After testifying before the U.S. Senate Judiciary Committee to establish a national database of convicted child abusers, she initiated the National Child Protection Act which was signed into law in 1993. 64. In 2005, Oprah launched Oprah's Child Predator Watch List and her pledge to provide a $100,000 reward per case to those individuals whom the FBI or local law enforcement officials say provided critical information leading to the capture and arrest of fugitives featured on her show or website. 65. After the loss of her son as a teenager, Oprah's famously never had any other children, openly admitting over the years that she's never had the desire or felt bad about it. "If I had kids, my kids would hate me," she told The Hollywood Reporter in 2013. "They would have ended up on the equivalent of the Oprah show talking about me; because something [in my life] would have had to suffer and it would've probably been them." But in 2019, while speaking to People, she admitted that the girls at her school who call her Mom O are "the daughters I did not have." They are the daughters I did not have," she added.